Click Here to Order Securely Online! Rope bordered all sides top and bottom. Water proof.Lock Stitching on all rope borders. Rib line down center for extra suspension support points. Heavy braided rope border on top, bottom, and each vertical corner. These are simply the finest commercially produced batting cage on the market today. 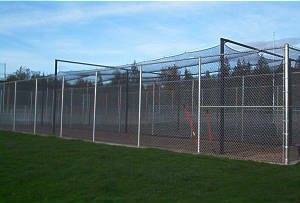 This cage is used by the Arizona Diamondbacks, the San Diego Padres, the Seattle Mariners, the Gonzaga Bulldogs, and other major league clubs and NCAA Division I Universities. These teams and hundreds of other use this model because they want the best! 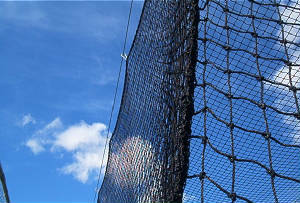 The pictures above are an actual nets that have been installed for parks department baseball fields. We of proud of the quality of our cages. You won't find cages any nicer than these.